Barbour County, Alabama is a county in the state of Alabama. Based on the 2010 census, the population was 27,457. Barbour County was created on December 18, 1832, from former Creek Indian territory and a portion of Pike County. Its county seat is Clayton. Barbour county is named in honor of James Barbour, who served as Governor of Virginia. Barbour County was named for Virginia Governor James Barbour. 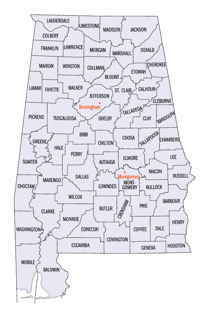 Barbour County was created on December 18, 1832, from former Creek Indian territory and a portion of Pike County. Its boundaries were altered in 1866 and 1868. The county was named for Virginia Governor James Barbour. Barbour County is located in the southeastern section of the state, bounded on the east by the Chattahoochee River and the State of Georgia. The county encompasses 884 square miles. The county seat was established in Louisville in 1833, and moved to Clayton in 1834. 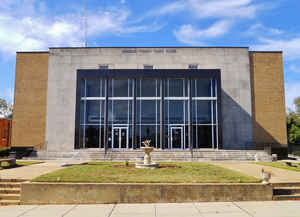 Today Barbour County contains two courthouses - one in Clayton and one in Eufaula. As reported by the Census Bureau, the county has a total area of 905 square miles (2,340 km2), of which 885 square miles (2,290 km2) is land and 20 square miles (52 km2) (2.2%) is water. The southern part of the county lies along the Gulf of Mexico, and the Tensaw River runs along the western edge of the county, where it feeds into Bon Secour Bay. 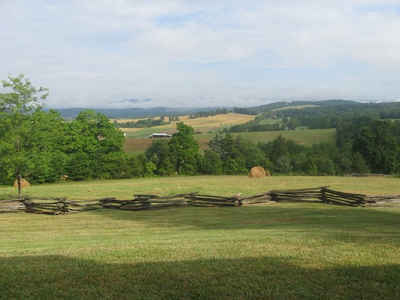 Northeast: Russell County; Stewart County, Ga.